I'm a devil for hoarding beer, sometimes past its best before date. In the case of big beers, that's fine but sometimes, you just need to clear out some space. Since I've moved from a house with lots of space to a smaller apartment with a lot less storage space, it's time to crack open a few. I cracked these open two weeks ago on Friday the 6th. 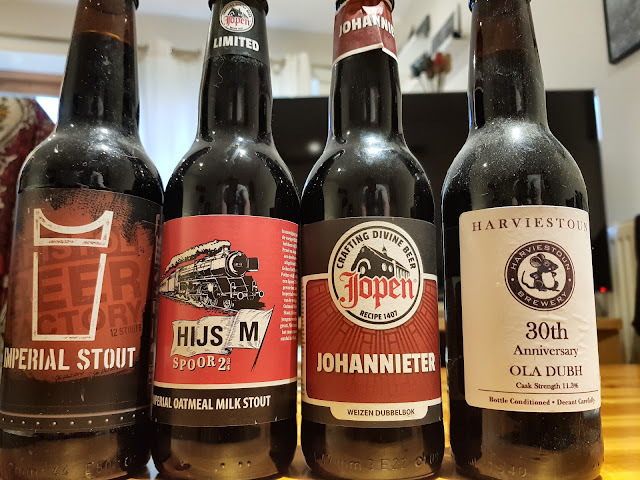 While the two Jopen beers in the middle were in date, the two British beers on the end were pretty old. 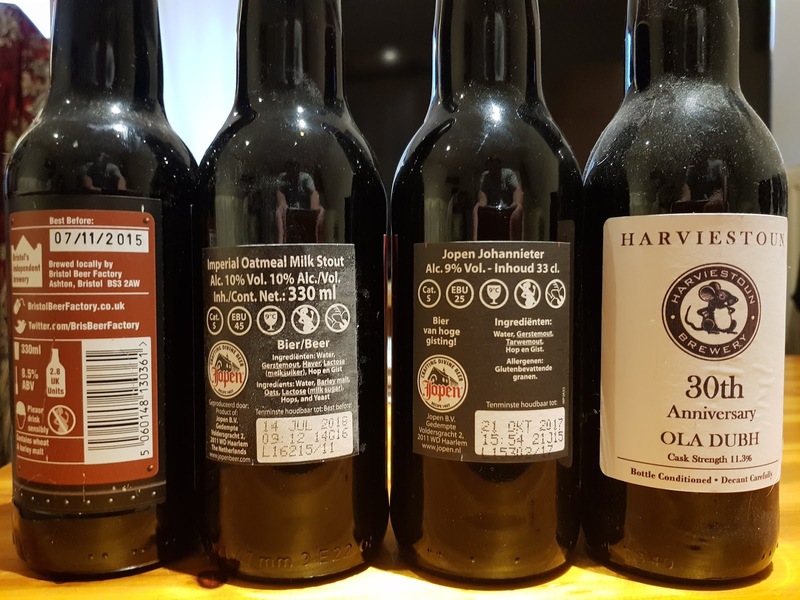 There's no date on the Ola Dubh 30th anniversary but the eagle eyed among you will see that it's not the normal label, it's 11.3% unlike the commercial release of 8% so this really isn't a beer that was available to the general public as far as I know. In fact, this was a pre-release in 2013 given to those at the European Beer Bloggers Conference, hence not having a date. It's my last one so I figured 4 years was enough and it was time to drink it. We were very special and privileged to receive it. We got pretty much all that we could carry home! The beer pores like black oil and it's flat. There's no head whatsoever. The aroma is all treacle and dark chocolate with a real burnt quality as well. There's some espresso but more of a burnt roast, creamy mocha sort of thing with a milky body. The carbonation is next to nonexistent but there's a tiny bit there if you start pushing it against your inside of your cheek. It has held up very well and I'm almost sorry I have no more for future tastings. 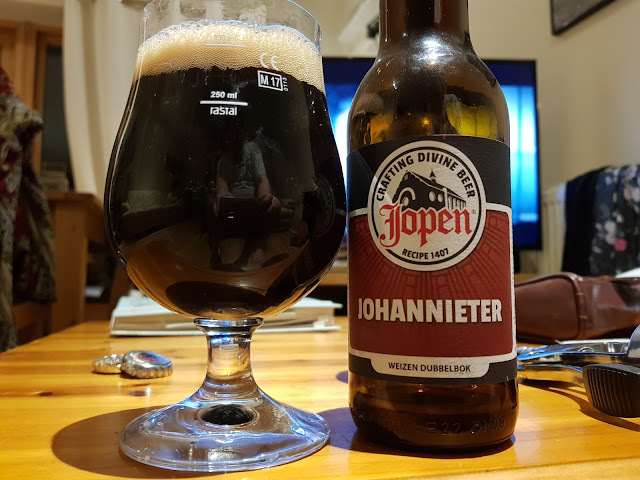 Moving on to Jopen's Johannieter. It's a weizen doppelbock at 9% ABV. There's some chocolate and dark fruits. I found it a little tart and quite carbonated. I just found it too thin and fizzy for what I expect a wheaty doppelbock to be like. It was only vaguely interesting for me. 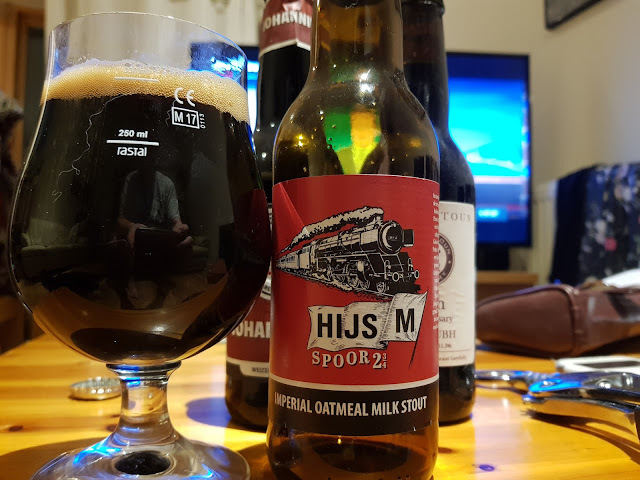 Sticking with Jopen, this beer is HIJSM Spoor 2 3/4 and is a collaboration with De Prael. 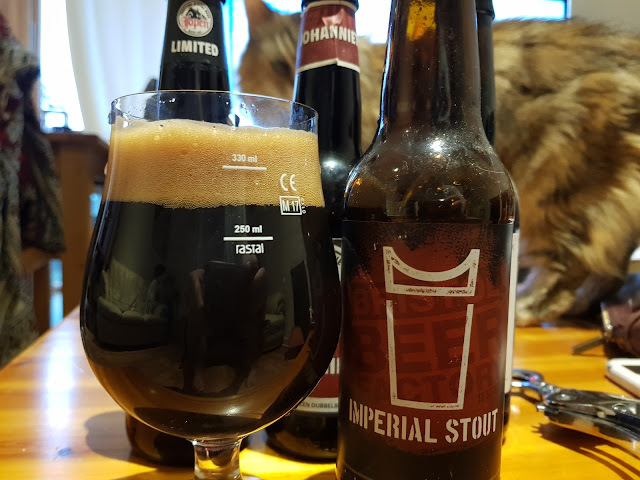 A big 10% Imperial Stout with an element of wizardry involved. On the nose are dark fruits, some alcohol, chocolate and prunes. Slightly fizzier than I might expect but being Dutch that make sense as they tend to over carbonate their beers. Medium, almost full body. I thought it was slightly metallic but not unpleasant. Not much in the way of milk and not as silky smooth as I would have thought from the use of oatmeal. It's a solid if overly carbonated imperial stout though. I suspect this could have done with a few years to mellow out. Bristol Beer Factory's Imperial Stout was a little more to my liking. Notes of chocolate and caramel on the nose. This had a BBF of November 2015 so I must have bought this in 2014 some time. I could taste a little alcohol and the barest hint of treacle and molasses. I thought the soft carbonation was perfect, though reading some old reviews, it seems it might have been over carbonated originally so time served it well here. I found it had quite a thin to medium body which was unexpected. A little vanilla in the finish and overall a very nice beer but I thought it could be better though. The question is, would it actually have been better before November 2015? Here's something funny, they no longer make this beer. When I was taking my Google Keep notes, I was trying out the voice recognition on my new Samsung Galaxy S8. It works pretty well but it mixed imperial up with ultimate. Looking at the Bristol Beer Factory's website just now, it seems that they have replaced this with Ultimate Stout. I wonder did someone have a similar smartphone experience and decide it was a better name than Imperial?